Home > Nightstand > Bloggiversary! Another year has rolled by and it’s time to celebrate my blog’s 8th anniversary. Eight years. I cannot believe I’m typing that. Granted this past year may as well have been the year of the absent blogger but my love for books has been as strong as ever. I hope that one of these days my love for blogging will return. I guess not so much love, I still do enjoy it but I’ve just felt the need to pull away. I’ve needed the time that was going into blogging to focus on other areas of my life. My family, my crafting, etc. I know many of you can relate to that. What with vacation coming up and my craft show in the middle of August the posts will still be hit or miss but I just couldn’t miss out on this opportunity to thank all of you blog friends. Thank you for sharing your love of reading with me. 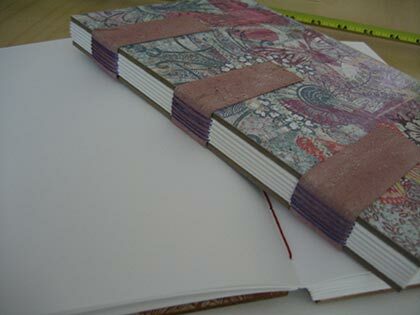 This journal is bigger, has heavier paper that is great for pencil, pen & ink, charcoals and maybe even some light markers. Like my beaded journals, it also lies flat so it’s great for journaling. 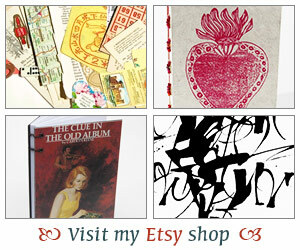 These journals aren’t yet in my shop but will be later this Summer. So leave me a comment, I would love it if you could recommend a good read and I’ll do a random drawing this Thursday. I’m off to celebrate my bloggiversary with a visit to the bookstore and planning my vacation reads. Yay. Have a great start of the week and more soon. Iliana, I can’t believe that you’ve been blogging for 8 years. Wow! Such an accomplishment. I’m not sure I knew what a blog was in 2004. I truly understand the pulling away impulse. I’m just glad that you are updating now and then. In my opinion, letting us know a bit of what you are up to is enough. At least for me. The personal aspects that bloggers choose to share are becoming my favorite parts of most blogs. I enjoy them so much. Have a good bookstore shopping trip! And I’m reading Deborah Crombie mysteries right now. I’m on book #7, I think. Have several more to go to catch up and what a joy that is. Happy blogiversary! I just finished Gift From the Sea and loved it! Happy blogiversary! Well done on 8 years and that you do find it satisfying still, even if it is different to how it used to be. 8 years is AMAZING. Good for you! And even though you don’t post all the time, I love it when you do. I completely understand where you are coming from on the time constraints. I’ve been struggling with that this summer as well, and think I will stop posting on Fridays in July. Just to give myself a break and a chance to catch up! As far as book recommendations, I have been telling everyone to read Gone Girl. My review is coming up this Tuesday. It is a thriller, and a twisty, demented one at that. You would love it. Hey, Ili, happy eight years! Wow, what an accomplishment. I hope you’ll give some details of the show in August, because we will be in the area around that time. I just read The Autobiography of Mrs. Tom Thumb and really liked it. It’s a novel, but based on historical fact. What an interesting life she had! Happy 8 wonderful blogging years!! Happy blogiversary! 8 years is an amazing accomplishment! Some good books I’ve read lately include The Far Side of the Sky by Daniel Kalla and Sea Change by Karen White. Thanks for the generous giveaway. 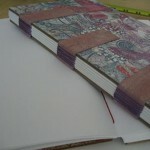 Your journals are beautiful! I just started to follow your blog and really enjoy it. Congrats! Please place me in the drawing for a journal…. Please enter me in the drawing for the journal. I would love to have one. They are beautiful! Congrats on 8 years! Happy Bloggiversary Iliana! I still enjoy your blog after all these years and I hope there are some years yet to come! Wow. 8 years? Congratulations! I’m glad we’ve still got you – occasionally or not. I’m glad you’re enjoying other aspects of your life as well, and the new journal line, based on that picture, will be a sure hit. As for recommendations, I can’t remember if we talked about this series, but I love Ellie Griffiths’ books. They’re really interesting. Also, Miss Silver! I know you enjoy mysteries too, and this series is just so fantastic. Happy bloggiversary! 8 years is a long time. You’re bound to have years that you blog more or less. I think it’s pretty amazing you’ve lasted this long. I recently enjoyed Soft Target by Stephen Leather, a British thriller. It’s not my usual thing but I really needed something to shake up the reading and it did the trick. A very happy blogiversary to you, Iliana! Hugs!